PUBLIC NOTICE - The vendor has been in receipt of an offer of £200,000 subject to contract for the above property. Anyone wishing to place a higher offer must do so before legal exchange of contracts. A 2 bedroom mid terraced house requiring updating throughout and being situated in this tucked away popular position with in the Green Lane development. The property offers entrance hall, kitchen, sitting room opening into sun room, 2 first floor bedrooms and bathroom. Enclosed rear garden with personal door to garage and additional off road parking space. KITCHEN: Window to front. 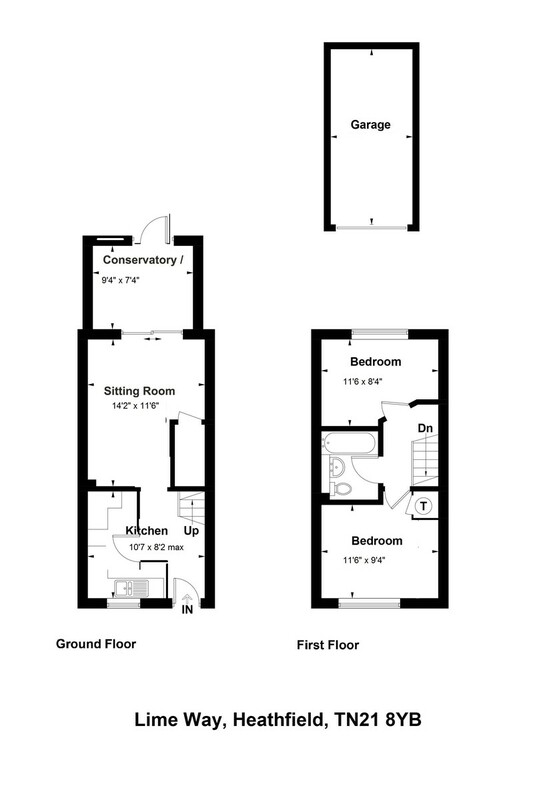 Range of cupboards and space for appliances. GARDEN ROOM Laminate wood effect flooring. Radiator. uPVC double glazed window & door to rear garden. BEDROOM 1: Window to front. Radiator. BEDROOM 2: Window to rear. Radiator. BATHROOM: Suite comprising of WC, wash basin, bath with shower unit over. Localised tiling. EXTERNALLY: To the rear there is a fence enclosed garden with decking area, area of lawn and a personal door providing access to a single garage with up & over door to front. We are advised that there is an additional off road parking space nearby. DIRECTIONS: From our offices in Heathfield High Street, proceed down Station Road to the traffic lights by the Heathfield Tavern. Continue over the cross-roads onto the Green Lane development, taking the fourth turning on the right into Lime Way where the property will be found after a short distance on the left hand side. TENURE: We are advised the property will be Freehold upon completion.